In the latter half of 1838, Cherokee People who had not voluntarily moved west earlier were forced to leave their homes in the East. The trail to the West was long and treacherous and many were dying along the way. The People's hearts were heavy with sadness and their tears mingled with the dust of the trail. The Elders knew that the survival of the children depended upon the strength of the women. One evening around the campfire, the Elders called upon Heaven Dweller, ga lv la di e hi. They told Him of the People's suffering and tears. They were afraid the children would not survive to rebuild the Cherokee Nation. Gal v la di e hi spoke to them, "To let you know how much I care, I will give you a sign. In the morning, tell the women to look back along the trail. Where their tears have fallen, I will cause to grow a plant that will have seven leaves for the seven clans of the Cherokee. 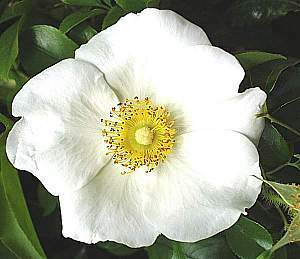 Amidst the plant will be a delicate white rose with five petals. In the center of the blossom will be a pile of gold to remind the Cherokee of the white man's greed for the gold found on the Cherokee homeland. This plant will be sturdy and strong with stickers on all the stems. It will defy anything which tries to destroy it." The next morning the Elders told the women to look back down the trail. A plant was growing fast and covering the trail where they had walked. As the women watched, blossoms formed and slowly opened. They forgot their sadness. Like the plant the women began to feel strong and beautiful. As the plant protected its blossoms, they knew they would have the courage and determination to protect their children who would begin a new Nation in the West.